Napkins from a Plane #1 is an 11″ x 11″ inkjet print in an edition of 5. It comes in a simple white frame. Napkins from a Plane #1 is an 11″ x 11″ inkjet print in an edition of 5. 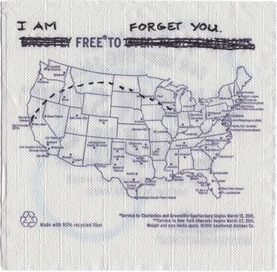 It depicts an original napkin that was drawn-on by the artist to say “I Am Free To Forget You.” It comes in a simple white frame.